Looking for a small Powerful Bluetooth speaker with great sound, excellent portability and a solid build? The Bose SoundLink Mini is on top of its game when it comes to rich quality sound, awesome portability and a top notch quality build. This Small Bluetooth Speaker is not cheap at a price tag of under $200 but the quality and design and sound are definitely worth the price and like most things in life you do get what you pay for. The Bose SoundLink Mini is currently the smallest wireless speaker in Boses collection. The mini is considered to be the baby brother of the full-size soundLink, but to me anyway they look completely different. As far as design goes the soundLink mini is a minimal looking speaker that is smooth and more rounded than its other rivals which tend to go with a more traditional box shape design. The Bose SoundLink Mini is most likely intended to be used around the house, included with the speaker is a nice and easy to use dock where you can just plop the speaker with ease when you are low on battery. I personally took the speaker on a couple of journeys into the outside world like to the beach, a few BBQ and I like to take my showers with the speaker playing some nice tunes on the window sill and it performed very well in an outdoor environment as well as it does inside. The Build quality is top notch as expected from any Bose product. The double sided grilles are coated metal, the rest of the speaker is a solid 2mm thick single piece of anodized aluminum. The buttons on the top of the speaker are rubberized coated so it can take a few splashes of water here and there but I would not recommend swimming or showering with it. The speaker also has a nice heft to it when you hold it so it adds to the quality feel. The Bose SoundLink Mini is somewhat versatile when it comes to its features. For instance you can charge the speaker without the dock using the included charger and there is a 3.5mm Aux input for the gadgets you use that dont have Bluetooth. Additionally there is a micro USB Port on the bottom to upgrade the firmware. 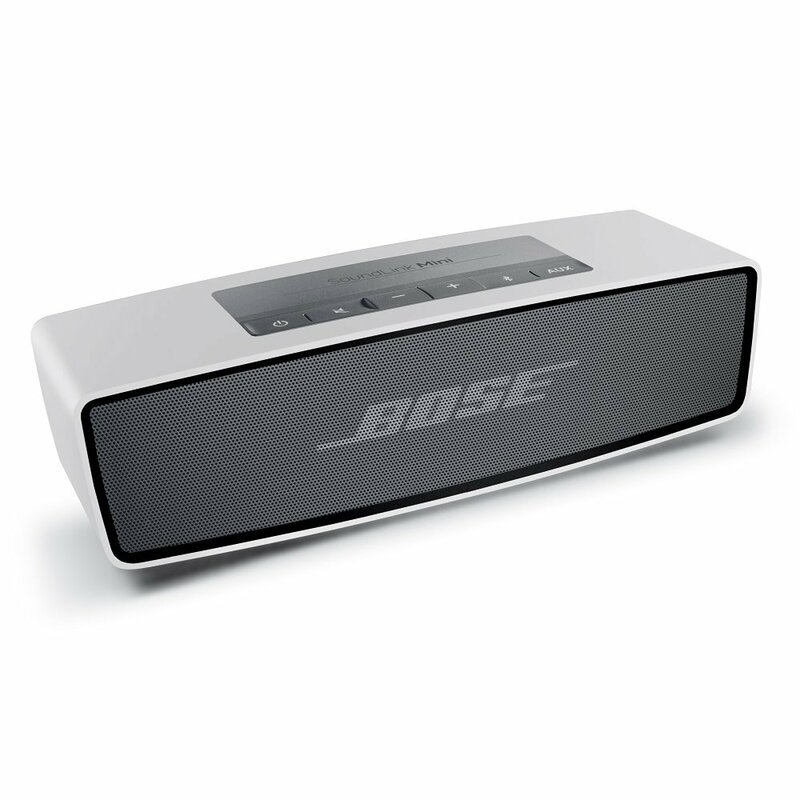 The Bose SoundLink Mini has a driver array that makes use of the small space available inside the speaker. The SoundLink Mini is equipped with dual 1.5 active drivers and also a pair of passive bass radiators. The only way for Bose to achieve such an ample amount of base through such a small speaker was with the bass radiators and you would not expect the amount of base this little speaker can produce given its size. All the components are applied with great engineering. You can crank the speaker to the max and you will not have any distortion.The quality of the sound is solid. The treble is balanced and the sound produced is warm and rich. Obviously there are limits to what a small sized speaker can do so dynamics and definition are limited. The Bose SoundLink Mini does not have the width and sound array of a larger speaker but among its peers its a top performer. The Bose SoundLink mini is definitely one of the best Bluetooth speakers in 2017 and is worth the asking price. You will not be disappointed if you purchase the Bose SoundLink Mini. While it’s fairly expensive at $200, the Bose SoundLink Mini is one of few standout products in the ultracompact wireless speaker category, featuring a top-notch design and very good sound for its tiny size.